dictate2us is the UK’s leading outsourced transcription and translation solution. Established in 2006, we bring high quality, reliable and trusted transcription, translation and typing support services to a large range of sectors. We have extensive experience in supporting all individuals and organisations involved in the legal sector, including barristers, solicitors and the Courts. Our specialist legal team understands the needs of the sector and operates in accordance with our strict Data Protection policy. The d2u: Transcriber application is free to download for iPhone, iPad and BlackBerry. Experience the power of our award-winning transcription service in your pocket. Dictate securely on the go and get your documents back by the time you arrive at your desk with our unbeatable 1 hour service! 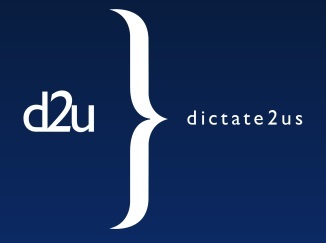 Visit dictate2us.com to find out more. You can also initiate a free trial or get a free no-obligation quotation for any of our services. All you need to get started is a digital recorder, such as a dictaphone or your smart phone, and an email address. You can even use a telephone line at the local call rate anywhere in the world.